Only two days left . . . 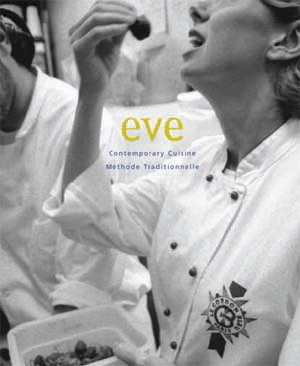 Menu for Hope ends this Friday, December 21, so you have two days to bid on the G3 prize — a cookbook and spices from eve – the restaurant, smoked salmon from Tracklements, and a gift certificate from everyday wine/everyday cook. Reports from the field suggest that the donation process needs a bit more explaining, so here are some simplified directions. 2. At the top of the page, click on GIVE NOW (under “Total Raised”). 4. Enter email address and follow the steps to complete the donation. 5. IMPORTANT: Please specify which prize you’d like in the Personal Message section in the donation form when confirming your donation. You must write in how many tickets per prize, and please use the prize code. The code for the G3 prize is UC18. Thanks for considering a donation! A little over a year ago,* I tempted you with a tantalizing description of these brown-black beauties, the Williams Sonoma Chocolate Crinkle Cookie. I wrapped it up in a tale about how I hadn’t been able to cook in my kitchen, due to a nasty roommate situation, which was a rather lame thing for me to write about. Even more lame — I hid them from your sight, and didn’t even share a recipe with you. Shame on me. Do you (few, brave) readers come here looking for stories about unpleasant roommates? I believe that you do not. Today, I remedy these wrongs. I can hold out on you no more. Melt the butter and chocolate on top of a double boiler, over simmering water, and stir often. Remove and set aside to cool a bit. In a small bowl, stir together the dry ingredients — flour, cocoa, baking powder, and salt. Set aside. In a large bowl, combine eggs, granulated sugar, and vanilla. Beat on medium speed for about 3 minutes. Beat in the melted chocolate mixture on low speed until blended. Add the dry ingredients and beat until incorporated. The dough will be stiff, but you must persevere: mix in the chocolate chips by hand. Cover the bowl with plastic wrap and refrigerate for a good long while, at least 2 hours. I sometimes leave the dough in the fridge overnight. Place rack in center of oven and preheat to 325, though if you have an old, tempermental oven like I do, you might need to settle for 350. Line 2 baking sheets with parchment paper. Sift the confectioners’ sugar into a small bowl. 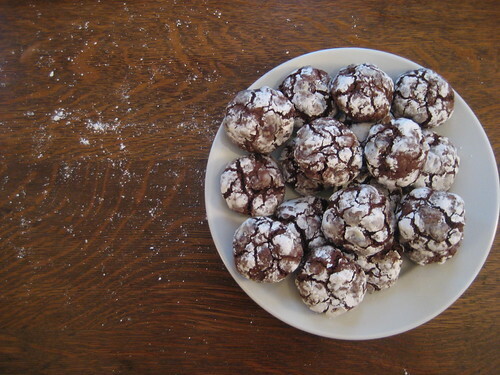 Roll a rounded tablespoon of dough between your palms into a 1 1/2 inch ball, and toss it around in the powdered sugar. Place the cookies about 3 inches apart on the cookie sheet. Bake the cookies, 1 sheet at a time, until the tops are puffed and crinkled and feel firm when lightly touched, about 13-17 mins. (My oven usually gets them done in about 15 mins.) Let the cookies cool on the baking sheets for 5 minutes, then transfer the cookies to wire racks to cool completely. *Yes, you read that right. G3 is a year old (plus a little bit). Thanks for reading! 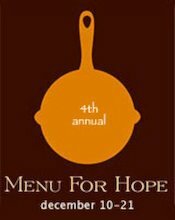 The Fourth Annual Menu For Hope, a fundraising event conceived of and organized by the marvelous food blogger Pim is now underway, and Gastronomical Three invites you to participate. For a mere ten dollars you buy the chance of winning a wonderful AA food prize. Or take a chance on any of the fabulous prizes donated by food bloggers all over the world. -And a gift card from Everyday Wines/Everyday Cook that you can use to pick up a couple of bottles of wine to go with the meal you’ll be making, take a knife skills class or to fund a pretty serving dish. Because of the gift card, this prize might be best for those who live in or visit Ann Arbor frequently, but if an out of towner would like the prize, one of the Gastronomical 3 could serve as your purchasing agent at Everyday Cook. But don’t stop at our prize, whose special code is UC18 — there’s a veritable flood of them at Kayln’s Kitchen, our midwest foodbloger hostess. And Chez Pim has a comprehensive list of all prizes from participating food bloggers. And in case you’re wondering, we don’t handle any of the money stuff ourselves. Pim’s set up a secure way to do this on the FirstGiving site. 1. Choose a prize or prizes of your choice from our Menu for Hope at Chez Pim. 2. Go to the donation site at First Giving and make a donation. 5. Please check the box to allow us to see your email address so that we could contact you in case you win. Your email address will not be shared with anyone. 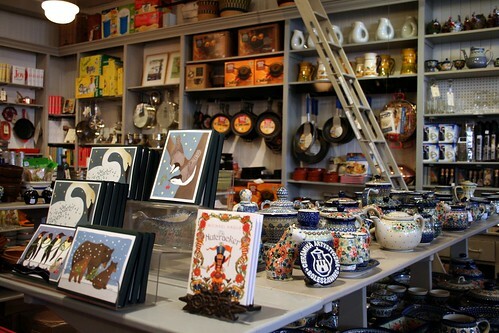 Check back on Chez Pim on Wednesday Jaunary 9 for the results of the raffle. 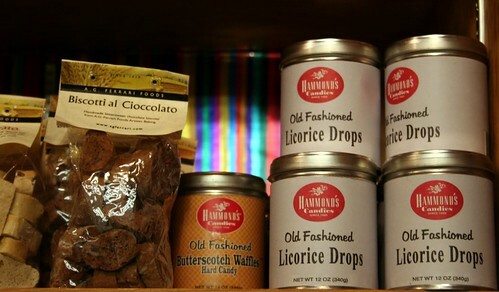 But in some ways, it’s too easy to fall back on the loaf of chocolate-cherry bread or jar of Italian chestnut honey or really, really great bottle of vinegar, and I forget what an amazing town Ann Arbor is for stocking the pantry and, well, the stocking. So, in honor of the holidays and the accompanying gift-buying frenzy, we’d like to remind you of some of the many places in Ann Arbor where you can buy gifts that please the palate and the eye — with the bonus of supporting the local merchants that are our friends and neighbors and that do so much to give our town its special and delicious character. I could probably do my holiday shopping from start to finish just by wandering around the Kerrytown shops. 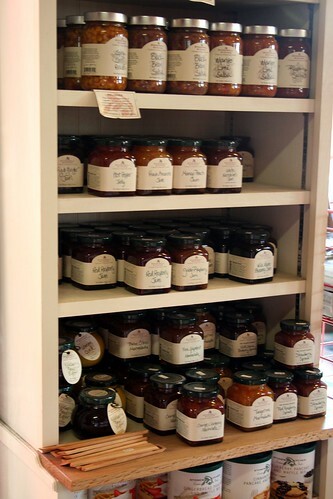 Let’s start on the ground floor, with Sparrows Meats and Produce. Now, personally, I’d be pretty excited to find a whole leg of lamb or a pound of Parma ham under the tree, but I realize I might be in the minority. 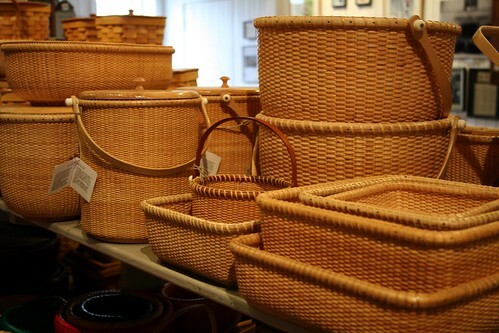 Still, Sparrow’s has a lot (and more all the time) of attractive speciality goods that would look pretty in a basket or canvas tote (and there are some really cute Ann Arbor totes with monkeys and coyotes and such outside at the market on Saturday and Sundays.) Lately, I’ve been particularly taken with the breakfast items. 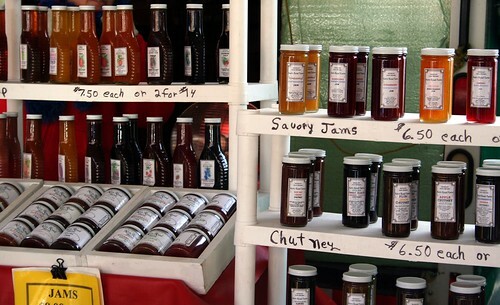 How about a basket of pancake mix, pure maple syrup and fancy pants jams? With a pound of Michigan bacon on top? If you’re more inclined toward evening pleasures, wander next door to Everyday Wines and pick up something from their eclectic and thoughtful selection of wines for under twenty-five dollars. They have a small but pretty selection of wine glasses as well, and a couple of Reidel O glasses might make a nice addition to that bottle. 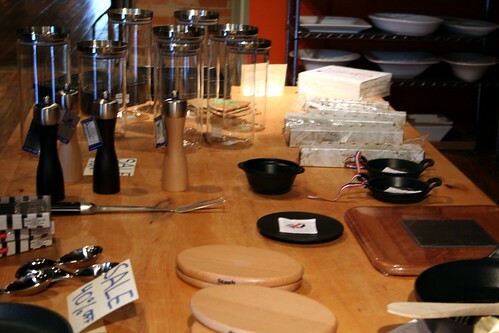 If you want to give your food-fond loved ones something a little more durable, stop in at Everyday Cook where table and kitchenware are arrayed like art objects in the exposed brick and bare wood gallery setting of the shop. There’s a nice mix of inexpensive and useful kitchen tools and higher-end cooking utensils and serving dishes. Last year I bought John a new rectangular pizza stone there for about 25 dollars and it’s been helping us turn out one great pizza after another ever since. Right now, I’m liking those white serving dishes you can see in the back of the photo above. In case anybody’s wondering. Even though it’s pretty cold outside these days, you should leave the building to go around the corner and check out Tracklements. Tracklements is one of those places that has more of a reputation outside of Ann Arbor than in it. 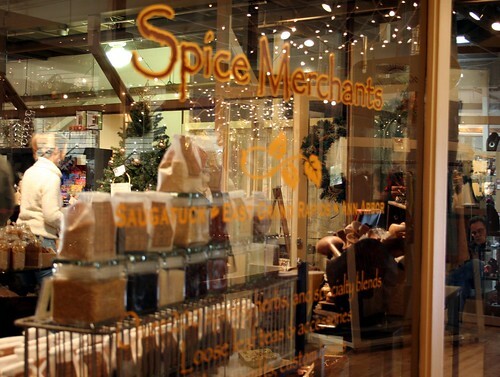 It has a thriving mail order business and has been mentioned in the the New York Times. But it’s tiny and not open very often, so I think it doesn’t get as much local attention as it deserves. JR offers some great gift assortments on his web site. If you’re able to stop in sometime when he’s open (Saturday mornings always work) you can put something together yourself. I’ve never been able to quite get my head around all the varieties of smoked salmon (scottish, pecan, tamari, etc, etc) but every one that I’ve tried has been wonderful. For the holidays, I’m particularly partial to the elegant (and somewhat lighter) smoked trout. And yes, especially because it’s pretty cold outside these days, you should at least make a run through the market if you’re there on a Saturday. Buy something from those nice folks just to reward them for their bravery in showing up on the mornings when it’s dark until almost eight and always below freezing. 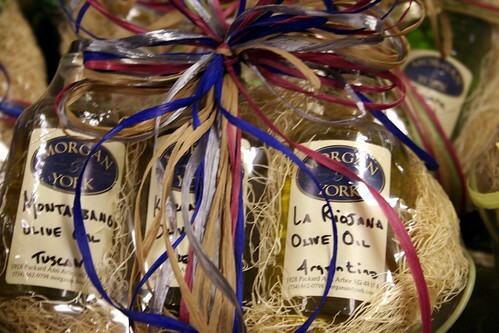 Most of what’s out there is more of the hostess gift or stocking stuffer variety than the big-present-under-the tree sort of thing, but I can’t imagine anyone would turn up a nose at pound of fresh biscotti or some farm-made jam. 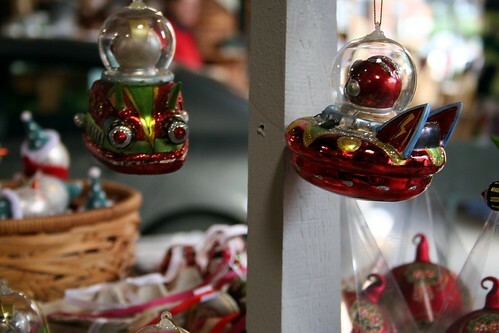 And DGH also has buckets of Christmas cuteness in the form of ornaments and small toys that you can use for the final, festify-ing touches on your gift baskets. For a final shopping stop, I’d recommend Morgan and York. Sadly, you’ll probably get in your car for this one, although if you’re a hardy type and don’t mind Packard traffic zooming by, it’s a possible walk from downtown. I’m only just getting around to forgiving the betrayal of the beloved Big 10 Party Store name and the horrifying rumor that the current owners wanted to take down the Cheese, Cheese, Cheese sign. I called the store “Pecan and Pork” for about a year in protest. Nevertheless, they’ve steadily won my affections. I really like the folks that work there and their cute little blue coats and mostly their amazing selection. Everyone is friendly and smart and enthusiastic about food and they have beautiful cheeses, charcuterie and various preserved things. If you want something a little less perishable, they have a lot of high end packaged goods, great (but slightly pricey at fifteen dollars a pound) locally roasted coffee and the best selection of Haribo gummi candy in town. They do appealing pre-packed gift baskets, all lined up to grab and go, but if you have the time, it seems a lot more fun to put one together yourself. But mostly, of course, they have wine. Crates and crates of it. They don’t have many low-end bottles, but they have an enormous and interesting selection in the 15-30 dollar range. If you’re feeling really generous (or festive), they have a ten percent mixed case discount. It’s an easy place to fill a case. While we’re in Morgan and York, I want to give a special shout-out to Sweet Gems, the confectionary that they host. Sweet Gem’s truffles have to be the prettiest edible gift in town. They come in both familiar and exotic flavors, are adorned with stunning leaf and flower patterns and beautifully packaged in clear or aqua boxes with lovingly tied bows. And the nice Morgan and York guys are equally patient if you’re picking out two or two dozen. I have a guilty feeling that I’ve just presented my Christmas wish list in the guise of buy-local boosterism, but I’m trying to assuage that by believing that at least a few of you might share my tastes or know someone that does. I’ve missed a lot of places in town and might get a chance to circle back to them before the holidays, but I’m also wondering what our readers have to say. What local treat would you like to receive this holiday season? Well, that certainly didn’t last long. 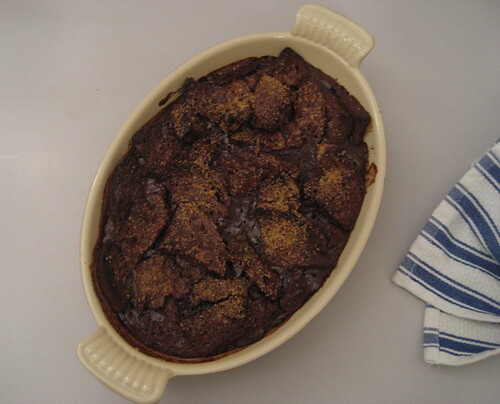 Yep, I’m (half-) sorry to report that my post-holiday plan to eat more modestly was scuttled the other day, when this chocolate bread pudding popped out of my oven. When the temperature dips down to teeth-chattering levels, my drafty apartment feels best when the oven is on. A half a loaf of bread was going stale. Half of a carton of heavy cream was ready to be used, or else. Ditto for a carton of whole milk. Something had to be done. And when you think about it, making this dessert was a virtuous act — using up all these ingredients in such an efficient way. Is it my fault that it was also ridiculously decadent? Before sharing the recipe, I should note that bread pudding has only recently made its way into my repertoire. It never really spoke to me, probably because it has a tendency to get mushy; however, any doubts I had are now a mere memory. This bread pudding, with a healthy sprinkling of raw sugar, makes the top all sparkly and crunchy–a nice counterpoint to all that chocolate-custard-y goodness lurking underneath. And did I mention it has tendency to disappear on you? Bring cream, 1/2 cup sugar, and milk to simmer in heavy medium saucepan, stirring until sugar dissolves. Remove from heat. Add 1 cup chocolate chips and whisk until melted and smooth. Whisk egg and vanilla in large bowl to blend. Gradually whisk in hot chocolate mixture. Cool chocolate custard 10 minutes, stirring often. 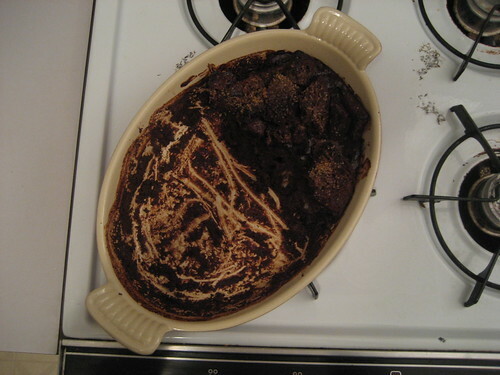 Add bread cubes and remaining 1/4 cup chocolate chips to custard and toss to coat. Let sit for 10 minutes or so. Transfer to 1 1/2-quart-capacity shallow oval baking dish. Sprinkle 2 tablespoons sugar over mixture. Bake until custard thickens and center is just set, about 50 minutes. Serve warm. Try to keep yourself from picking at the crusty, sparkly bits with your fingers. Save some for your significant other, children, friends, and you will earn their devotion many times over. Maria, Anne, and Shana--three women who eat, cook, and dine out in Ann Arbor. Contact us at gastronomical3@gmail.com.